Juice and tea hot filling line is used in hot filling and bottling for green tea, black tea and juice. The design is scientific and reasonable with good-looking appearance. Its operation and maintenance is convenient and is highly automatic.It is a good equipment for hot filling drink. Why choice hot-filling juice ? There are two kind of juice filling in the world. Aseptic cold filling and hot filling. 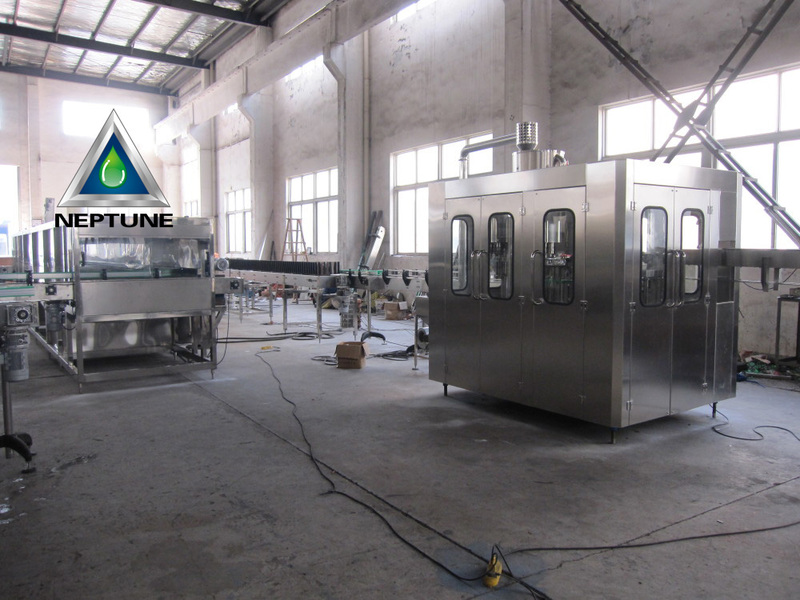 Aseptic cool filling machine and factory are kept sterile, so it is not necessary to add preservatives to the beverages, and it is not necessary to perform post-sterilization after filling and sealing the beverages. 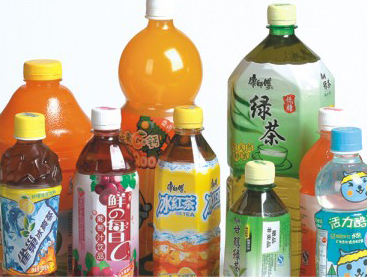 Long shelf life requirements while maintaining the taste and color of the beverage. But its whole production line price total over 2millions dollar and factory need very high standard. Hot filling: The product is UHT high temperature instantaneous sterilization, and then cooled to more than 90 degrees; after the completion of the filling, the product temperature is 88 degrees. Because the product is heated for a long time, it has a certain influence on color, flavor and nutrition.Its whole production line price total over 20K dollar and factory normal. Our concentrate juice& tea production line involves the water treatment unit, blow molding machine, air conveying system, tea/fruit juice/vegetable juice preparation system (homogenizer, degasser, ultra high temperature sterilizer, CIP machine, three-in-one hot filling system, sterilizing machine, Tunnel pasteurizer, auto conveying system, air purification system, OPP/PVC labeling machine, wrap shrink packing machine, and more). Provide whole drawing for the perform mould and bottle mould. Free charge for word design on the mould. We can help you install the machine; from setting machine, testing, and to check the machine is on the good workingcondition. There is a litter charge, only for flight charge and accommodation. 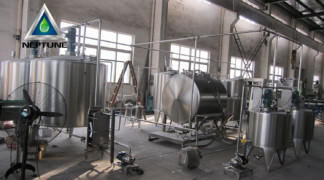 This is the RO system for producing drinking. The water supply is tap water. The water is first being removed the suspended matter, micelle and other impurity by the quartz sand filter. Then it is being got rid of the organic substance, chlorine, chromo, odor and etc by the active carbon filter and softener filter. The above device composes the consummate pretreatment system. The water which is being pretreated reaches the requirement of the RO system. So as to make the RO equipment run stably during a long period. Sugar Melting Pot is made of 304 Stainless Steel. It can melt the sugar to syrup by warming the tubular electric heating pipe and homogenize the syrup by motor’s mixing. This machine has both inside and outside layers, on the middle is the high quality temperature keeping material. It is the ideal equipment to melt sugar to syrup. First add water into the Sugar Melting Pot, and the water level should be about 25% of the total volume.Then pour the sugar into the machine, turn on the power and it will start to warm. After about 1 hour warming, the sugar will start to melt, at this time turn on the power to homogenize the syrup by motor’s mixing. Syrup Filter is made of 304 Stainless Steel. Inside is the pure natural tianzi cotton. Filtering by tianzi cotton is very clean and the operation is convenient. So the Syrup Filter is the ideal equipment to filter the syrup.First connect the Syrup Filter with the High Temperature Pump and Sugar Melting Pot. Then open the water pump to make the syrup in the Sugar Melting Pot filtered by the tianzi cotton in the Syrup Filter, so that the inpurity can be got tod of. Preparation Tank is made of 1Cr18Ni9Ti high quality Stainless Steel. It is composed of stack shell, cycloid pin gear reduction drive, mixing device to homogenize all the raw meterial with water. So it is an ideal equipment in drink, medicine industry, etc. It should be sterilized by sterilizing liquid before using. (User should prepare the sterilizing liquid for themselves.) After sterilizing, wash the machine and clean out all the sterilizing liquid by filtered water. The machine is the necessary key equipment for cold drink and milk drink,The pressure covers 250-60kg/M2,and the productivity covers 500-5000kg/m.The machine has filter unit to guarantee the machien operate normally. The deaerator is one of the necessary equipment in fruit juice or fruit tea production line.It is mainly used for deaerating the homogenized juice under vacuum condition and to prevent juice from being oxidized and then to proling the storing period of the juice. 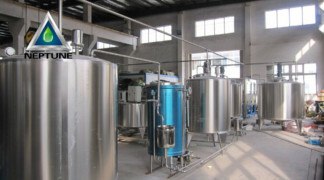 The device is widely used in milking and pharmaceutical industries,is necessary equiipment for heating,cooling,heat insulationg and steritizing the liquid material,It has the advantages of energy saving,noise eliminating,acid resistant,crack-proofmand easy cleaning and operating,It is also necessary equipment drink production line. Sterilizer Factory adopts advanced stainless welding techology from abroad,selecting the fine polished stainless steel tube.which had improved greatly comparing with the former productes we manufactured .There are two kinds of specification: manual control and automatic control,It is suitable for the liquid material,.such as fresh milk,fruit drink,wine,soybean milk and Chinese medicine,as well as the sticky material(For example.swear condensed milk) upon completing with high-pressure homogenizer.The information of other automatic UHT completing with aseptic packing machine is ready for you. The rinsing system is used not only to clean at site of material pipe of the industries like milk products, juice, beverage and recipients, but also to the beer and other food manufacturers. A centrifugal pump is used in CIP to convey cleansing liquid into material pipe and equipment recipients to force the cleansing liquid to circulate to make cleaning without taking apart pipes or equipments. With the system the equipment availability can be improved and intensity of labor lessened. So the system is an advanced and ideal equipment of cleaning technology. The detailed operation should be equipped and combined with the equipments in the plant, the layout of the pipes, the cleaning head, and so on.